Here at WhatShed we like to make sure that you folks are as well informed as possible about sheds. Types of sheds, sites that sell sheds and even brands themselves. That is why today we are putting together this in depth Suncast review. We are looking at what kinds of products are in this brand, how fair the pricing is and most importantly, questioning how good are Suncast products? 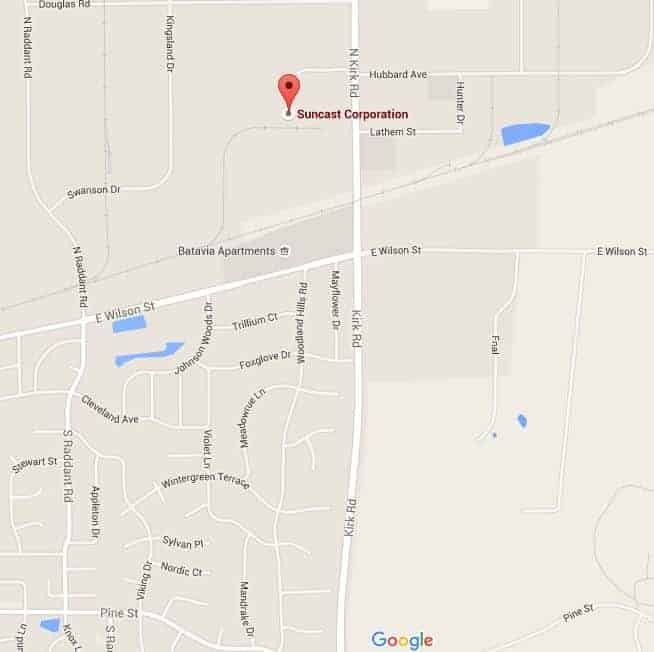 Suncast have been in business for over 25 years now and they have a variety of great products to their name. Based in the USA, Suncast have more than a few partners in the UK who sell their range of resin based sheds and storage products. Suncast is certainly a company you need to consider if you want something different than a traditional wooden shed. Suncast: What Kind Of Products Are In The Suncast Range? Sheds are the specialty of Suncast and they have a fantastic variety of sheds that really did impress us. 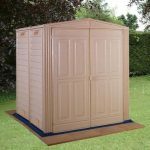 We are very impressed with the different sizes they offer, so for those of you who have a garden where space is something of a premium, you would still be able to enjoy a Suncast product as they have some smaller sheds sized 7 X 3 and 6 X 4. We love the style of their smaller sheds as they make some of them have that same, almost barn style as some of their larger ones. Speaking of their larger ones, Suncast make some very impressively large sheds. They have 8 X 16 and 8 X 13 sheds so if you have the space for it and you need a vast amount of space to do crazy experiments, store your collection of tools or just hide out from the other half and the kids, then they do have sheds that will allow you to do this. While they do have large and small sheds, Suncast have more mid sized sheds than anything else. We are talking sheds in the 8 X 6 range, give or take a foot or two. While Suncast do have many sheds that have a very distinctive shed style, they also have some other interesting storage structures as well. They have sheds that more resemble wall cabinets, which would be perfect for those of you who just need a small area to keep a few tools. Suncast also sell a vast array of other storage solutions ranging from storage tubs to large storage boxes to keep the kids outdoor toys from taking over the lawn. Suncast: How Is The Quality? Rather than use wood, Suncast make their sheds and other storage products from a high quality resin. We love the durability of this and have no doubts at all about its longevity and are sure that you will get many, many years of use out of one of their sheds. One thing that we just love about Suncast products is their roofs. Suncast have two roof styles and the most common one they use is a high apex style roof. This is what is used for most of their more traditional style sheds, but some of their other products use this very cool, shallow type of roof that we think is very unique looking. Suncast sheds as well as being made to last also are made to be very practical. This is most evident in the doors that they use. On the sheds that come with double doors, they have used these fantastic handles that make installing something like a padlock and chain very easy. 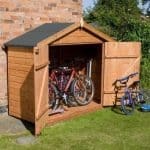 This may not sound like a big deal, but we love how they have clearly given some thought to how people can securely lock their shed and keep their belongings safe. When you purchase a Suncast shed, you are getting a structure that is very robust and is able to take quite a bit of punishment over the years. Be it from you accidently hitting it with the mower or the kids using the side of it as a set of football goals even though you have repeatedly told them not to. 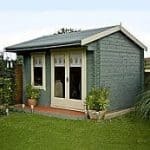 In addition to being strong, the resin that their sheds are made from is very easy to look after and you will not have to worry about treating it once you have installed it or once a year after like you do a wooden shed. 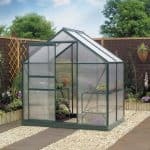 Suncast have made their products as low maintenance as possible. Also, you will not have to be worried about rot or even the shed getting discoloured as the years pass by. 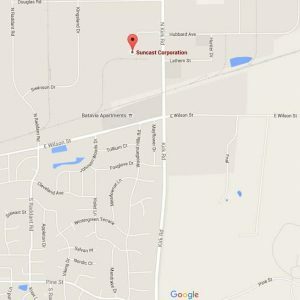 Suncast: How Are The Products Priced? 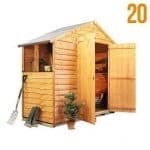 Here at WhatShed, we have noticed that plastic based sheds always cost more than a similar sized wooden shed. This is just something you have to come to terms with if you want a plastic shed, and honestly in many regards, we feel that a plastic shed is worth the extra money that they are asking. First of all, you have no maintenance issues that you have to worry about and also you know for sure that rot is never going to be an issue, even 20 years in the future. Also, in many cases it is easier to install a plastic shed. Still though there is no getting away from the fact that £589.99 for a 7 X 4 shed (which is what Shed Store have them priced at), is a fair bit more than you would pay for a standard quality wooden shed. One of the larger Suncast sheds that is available here in the UK, is their awesome looking New Tremont Two 8 X 13 shed, which is priced at £1,539.95. Honestly we do not feel this is out of line at all and actually consider this to be a fair price for a shed of this size and immense quality. Clearly some of the Suncast products are going to be out of reach for people who are on a tighter budget, but that does not mean we feel they are overpriced. Plastic sheds always cost more, but with that extra money you are spending you are getting some benefits. So while a wooden shed will be cheaper, just remember the maintenance that is required in order to keep it looking good as well as potential rot problems that may occur 10 or 20 years down the road. In general, when it comes to pricing, we feel that Suncast are very in line with what the other plastic based shed brands are asking. Suncast: How Customisable Are Suncast Products? Suncast do not offer customisation options with their sheds, but this is the same case for other plastic shed brands as well. One thing that they do very well is offer many sheds in different styles. For example, they have a few different 7 X 7 and 7 X 10 sheds, but each one has its own style. This is great as it does in a small way make up for you not being able to customise a shed directly. One 7 X 7 for example will have windows and another will not; one will have a brown door and another will have a grey. So if you have a specific size of shed in mind then there is a high chance that Suncast will have a few different looking sheds in that size. 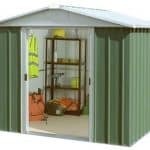 We really like the design of the Suncast sheds and feel that they have done a fantastic job in making sheds that are not only strong and long lasting, but also very easy to look after. We have seen many brands who specialise in plastic based sheds and Suncast are certainly up there with the best of them. While they may not have things like garages and workshops as part of their brand, for those of you who just want a great looking, high quality and long lasting shed, Suncast is most certainly a brand that should be on your radar.